We love Gemma Jones, curator of Melbourne's hugely popular Outre Gallery, for organising the art raffle Art Fights Fire - a Victorian bushfire fundraiser. With amazing donated works from local artists including Neryl Walker, Beci Orpin and photographer Natalie Jeffcott, plus International artists, everyone is gearing up to show their love and support. on Wed February 25th. Tickets $10.00, all proceeds go to Red Cross Bushfire Appeal. Everyone has fallen for new bar, Honey. And it's no wonder, as it's the conception of most loved South Melbourne local, Steve Vallas. Step inside and you'll find works from local artists and designers. But most importantly, what's the most loved drink? It's got to be the "The Passionista" And food? You can't go past the Linguini with sautéed prawns, scallops, mussels and fish...love. Melbourne band, The Violet Flames are already favs around town. But this weekend is even more special. Melbournites are set for a big night this Sat, at The Evelyn, for the indi rock band's single launch. Fav tracks include Come On and Last Goodbye. Very nice. Those in the know spend sat wandering thru Melbourne Central to Lenko, a Melbourne label designed by Dana. As soon as The Lenko Doodle art show was born, it quickly became the talk of town. Now, we've fallen in love with their new Spazmatron Necklace and handmade stuffed toys. The best bit, you can get it all from their online store. Nice work Dana. It's Xmas time in Melbourne and we love shopping at Craft Hatch. The November market, on this Saturday, will feature the most loved Dawn Tan, Gemma Johnson, LabthreeOFive and more. The perfect place to find those limited edition, handmade xmas presents. A must visit this weekend. 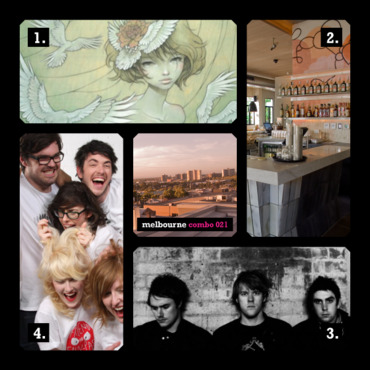 LoveBento fans have been writing in, itching to for us to feature Melbourne's Whitely. Their new album Go Forth, Find Mammoth is a true stand out and has even made it to no. 27 on the ARIA chart. As local Melbournites, Whitely is definitely one to look out for. Love them. Looking for a lazy Sunday morning venue to relax with breakfast and coffee? There are few as good as the Amsterdam Street cafe. Gorgious fresh food and crisp coffee is just the start - it's the retro fitout of the place and the creative front that brings it all home. Breaky or lunch, get yourself along! A great place for a drink after enjoying some of the delicious food in China Town is Manchuria. Sporting a contemporary chinese decore, this largely undiscovered bar is all about killer cocktails - and there are plenty of them to choose from. Martinis are great but if you're after something stronger try the Zombie. You can't go past this first level beauty.